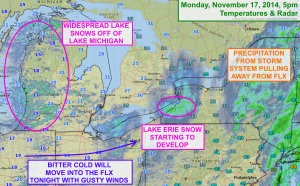 Bitter cold and lake effect snow are showing up just to the west of the Finger Lakes and will overspread western and central New York this evening. Click to enlarge. Precipitation from the large storm system that has impacted us today is pulling out.In some ways though, that was only the beginning. Bitter cold air is surging eastward on west winds with temperatures already in the teens across Michigan, Ohio and Indiana. While temperatures were still in the 30s at 5pm, lows tomorrow morning should be in the teens with wind chills near 0º. 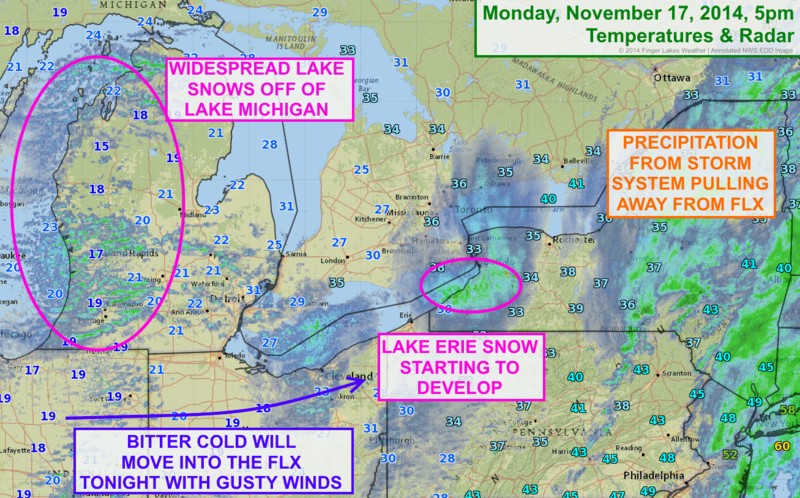 Lake Michigan is churning out widespread lake effect snow already as the cold air crosses the warm lake waters. West winds aren’t the best for Lake Michigan, but they are more favorable for Lake Erie and especially Ontario. As the cold air moves in, lake effect snow will become common across the Finger Lakes as well. Already, Lake Erie is starting to produce some snow. While the lake effect will remain somewhat disorganized tonight, it will spread far inland and coat much of the Finger Lakes with an inch or two. The hills of the eastern Finger Lakes could see as much as 4″ tonight. The lake effect will really crank up tomorrow into Wednesday, leading to blizzard conditions south of Buffalo and near Watertown, where the snow will be measured in feet, not inches.